The legendary story of the genesis of Lord Ayyappa in the Puranas or ancient scriptures is intriguing. After Goddess Durga killed the demon king Mahishasur, his sister, Mahishi, set out to avenge her brother. She carried Lord Brahma's boon that only the child born of Lord Vishnu and Lord Shiva could slay her, or, in other words, she was indestructible. To save the world from annihilation, Lord Vishnu, incarnated as Mohini, wed Lord Shiva and out of their union Lord Ayyappa was born. After King Rajashekhara adopted Ayyappa, his own biological son Raja Rajan was born. Both the boys grew up in a princely manner. Ayyappa or Manikantan was intelligent and excelled in martial arts and the knowledge of various "shastras" or scriptures. He surprised everyone by his superhuman powers. Upon completing his princely training and studies when he offered 'gurudakshina' or fee to his guru, themaster aware of his divine power asked him for a blessing of sight and speech for his blind and dumb son. Manikantan placed his hand on the boy and the miracle happened. 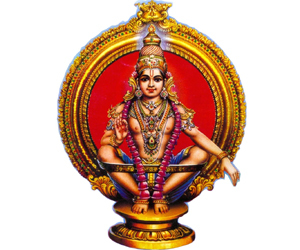 Lord Ayyappa is believed to have laid down strict religious adherence to receive his blessings. First, the devotees should observe a 41-day penance before visiting him in the temple. They should maintain abstinence from physical pleasures and family ties and live like a celibate or 'brahmachari.' They should also continuously contemplate on the goodness of life. Moreover, the devotees have to bathe in the holy river Pampa, adorn themselves with three-eyed coconut and 'aantha' garland and then brave the steep climb of the 18 stairs to the Sabarimala temple. Sabarimala in Kerala is the most famous Ayyappa shrine visited by over 50 million devotees it every year, making it one of the most popular pilgrimages in the world. Pilgrims from around the country brave the dense forests, steep hills and inclement weather to seek the blessings of Ayyappa on the 14h day of January, known as Makar Sankranti or Pongal, when the Lord himself is said to descend in the form of light. The devotees then accept 'prasada' or the Lord's food offerings and descend the 18 steps walking backwards with their faces turned towards the Lord.